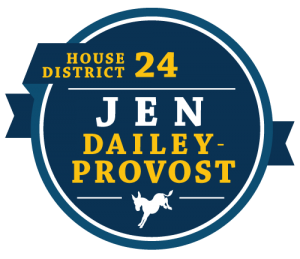 Jen Dailey-Provost lives in Capitol Hill with her husband Scott and three daughters. She received her bachelor’s degree in business from the University of Utah David Eccles School of Business, and her MBA from Westminster College’s Gore School of Business. She began her career as the Director of Human Resources at Solitude Mountain Resort, but ultimately found professional fulfillment in the non-profit sector. Jen is currently the executive director at the Utah Academy of Family Physicians in Salt Lake City where she manages the business of the 501(c)(4), as well as the UAFP Foundation, a 501(c)(3) that is focused on medical education in underserved areas. Additionally, she serves primary care and public health functions as the director of governmental affairs and policy, prioritizing policies like patient access to health care, social determinants of health, air quality, education, and reproductive rights. Jen and her family love the quality of life that Utah offers and take advantage of the incredible access to the outdoors whenever possible. She is most passionate about skiing and running, but Jen also loves to hike, bike, and snowshoe as often as possible. "Ready to work on Day 1"
Fired up. Ready to Fight. Prepared to Win.